As you develop your company’s brand, how do you determine what “personality” you should project? How do you know where your brand fits relative to other brands in the market? I always recommend that you do as much market research as you can. I also recommend that you study the archetypal systems developed by Carol Pearson (whose website is here). 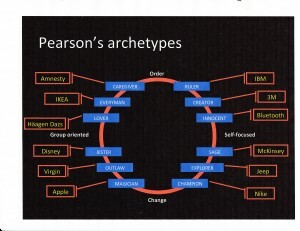 Pearson is a Jungian psychologist more than a marketing maven. She has developed a set of archetypes that help people understand how to use their inner resources to enrich their lives. Fortunately for us marketing types, these archetypes can also be applied to companies and organizations. They can help you understand how you fit into a broader ecosystem and how to convey your message most effectively. When I worked at Lawson Software, we used the simplified diagram that you see here. The diagram includes 12 basic archetypes with a company to illustrate each one. The circle helps you understand how the archetypes fit together. For instance, note the word “Order” at the top of the circle and the word “Change” at the bottom. Simply put, the companies on the top half of the circle want to maintain the existing order, the current market structure. By comparison, the companies on the bottom half might be described as “upstarts”. They want to change — or overthrow — the current market structure. The left and right halves of the circle also have much to tell us. The archetypes on the left side are group-oriented. Those on the right side are more self-focused. The simplest explanation is that those companies on the left of the circle focus primarily on their external constituencies. Those on the right focus more attention on internal processes and procedures. At Lawson, we quickly decided that we were on the bottom half of the circle. We weren’t the market leaders, we didn’t dominate the segment — we needed to shake things up to find our place in the sun. Similarly, we decided that we were on the left side of the circle. We were market oriented and our mission was to make our customers stronger. In other words, we were externally focused. So, we were on the lower left segment of the circle. We had three archetypes to choose from: 1) Jester, like Disney; 2) Outlaw, like Virgin; 3) Magician, like Apple. We then proceeded by elimination. We were a B2B company and just didn’t have the magical chops of Apple. Similarly, we weren’t a jester like Disney. Indeed, we were probably too serious. That left us at “Outlaw”. We never really liked that label but ultimately we decided that’s who we were. (We described ourselves as “disrupters” rather than as “outlaws” but, really, what’s the difference?) To succeed, we needed to break some rules. We needed to be different and shake things up. It helped that we had a plain-spoken and charismatic CEO who was not unlike Richard Branson. Choosing the outlaw/disrupter path almost immediately led us to use a cartoon character — very different than what you would expect from, say Oracle or SAP. With help from Fiftyeight, a very creative agency in Germany, we developed the Lars Lawson character as well as Sepp (for SAP) and ElCaro (Oracle spelled backwards). We then launched a series of video adventures on YouTube that typically garnered over a million views. (You can see the most popular videos here and here). Did it work? You betcha. We grew faster than our segment and gained visibility globally. Bottom line: whether you’re a person or a company, it helps to know who you are and where you fit. You can find Carol Pearson’s books here.